I just love eggplants — stir fried with beef or chicken, sautéed with onions and scrambled with eggs, eggplant parmesan, and a favorite — grilled eggplant with coconut milk, lemon juice, green onions and hot pepper. DELICIOUS! 1. 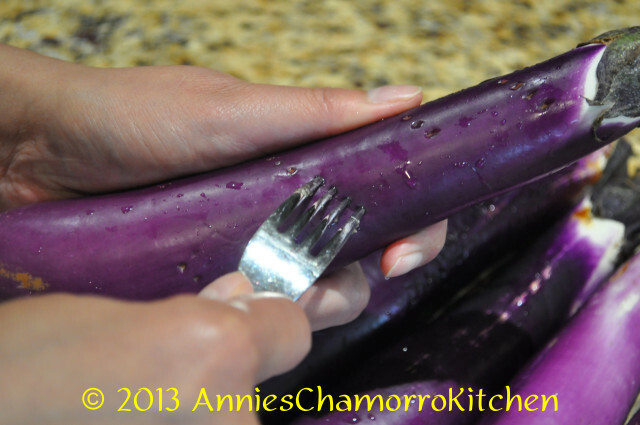 Prepare the eggplants for grilling by pricking them all over with a fork. This is so it won’t burst during the grilling process as the natural water in it heats up. 2. 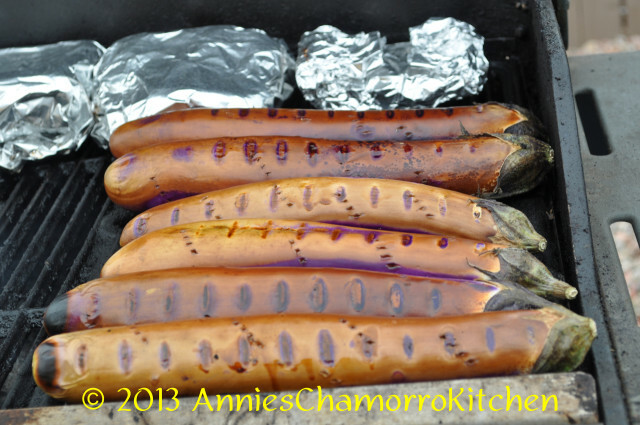 Grill the eggplants, turning them over frequently to ensure even cooking. 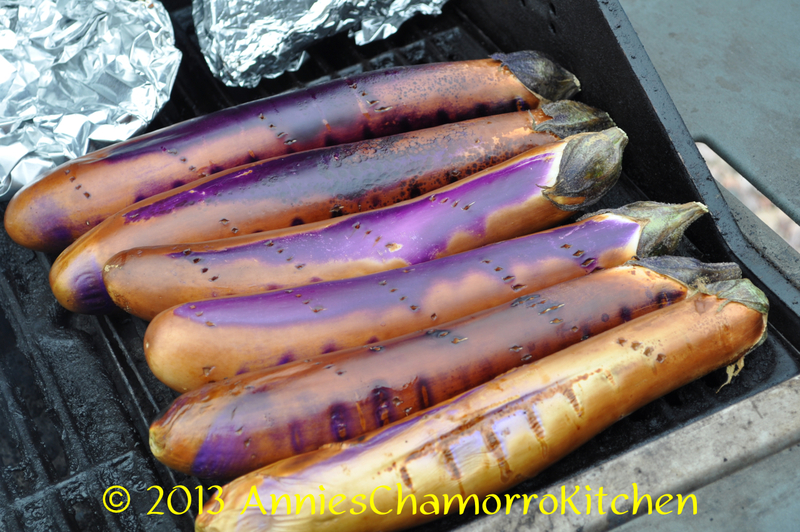 Grill until the skins are dark brown, even black and the eggplant is soft to when you touch it. 3. Soak the grilled eggplant in a bowl of water to cool it down. Peel the skin off the eggplant. Place the whole eggplants in a shallow dish (my mom actually cuts the eggplant into small, bite-sized pieces). 4. 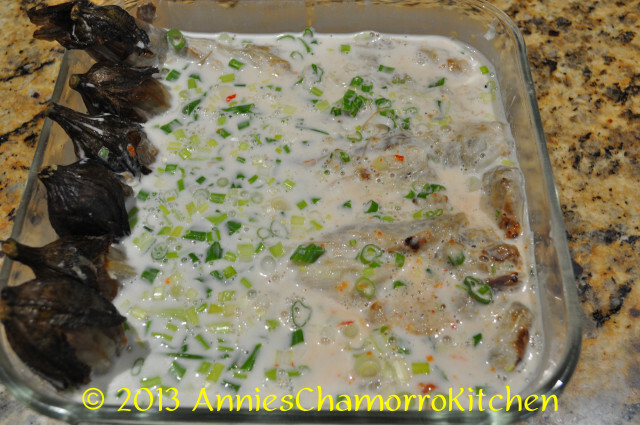 In a small mixing bowl, mix together the coconut milk or cream, lemon powder, salt and hot pepper. Mix until the lemon powder and salt dissolve. 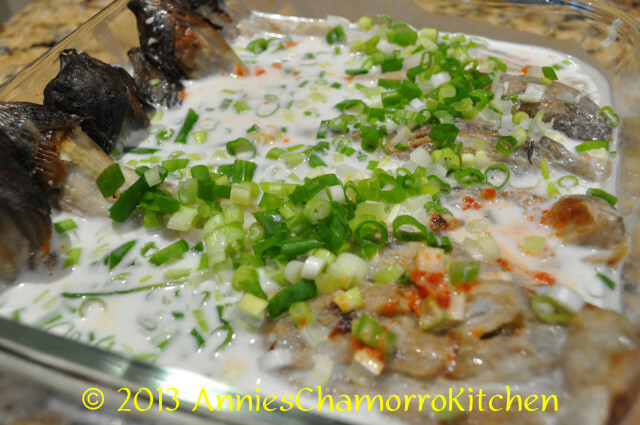 Taste, then adjust the amount of lemon powder, salt and hot pepper to your liking. Pour the mixture over the eggplant. 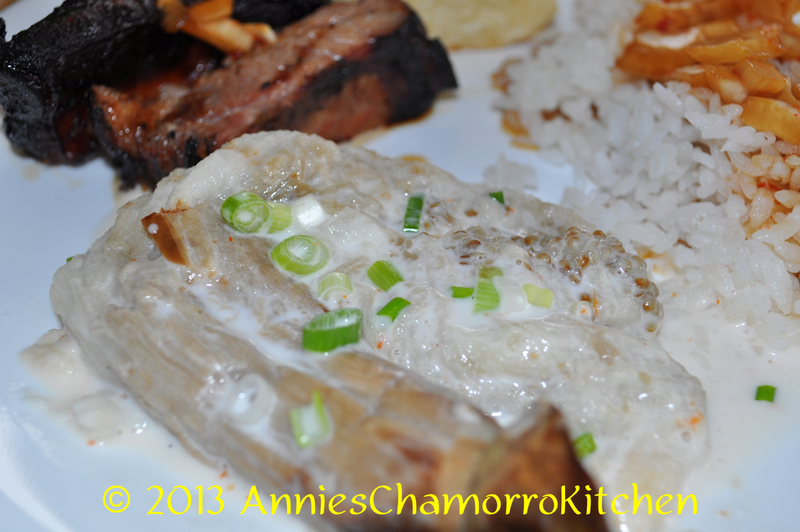 Sprinkle the green onions over the eggplant and coconut milk. Stir gently to combine. Serve and ENJOY! 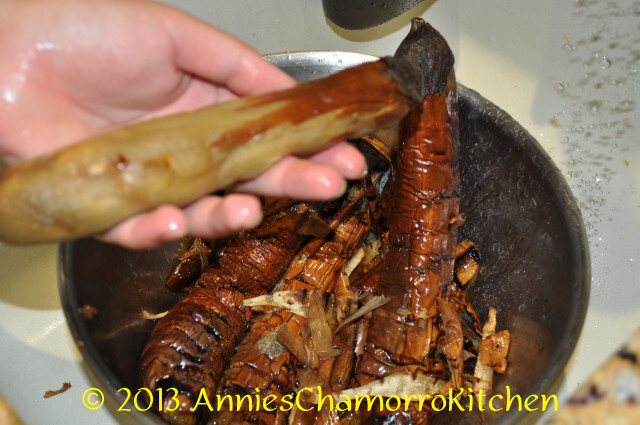 Note 1: I like to use the long, skinny Japanese eggplants for this dish. Buy eggplants that are still firm and not too fat, with very little to no blemishes on the skin. 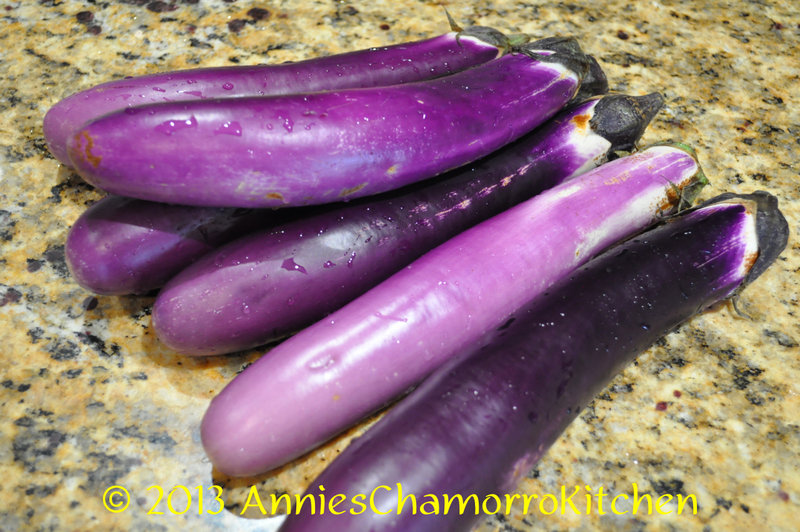 You can use the large, oval eggplants common in grocery stores, only use 1 or 2 smaller ones. You’ll need to grill or broil these longer as they are thicker and will take longer for the middle to cook through. 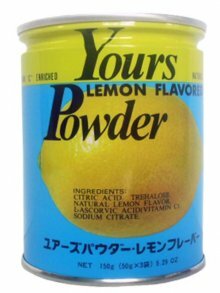 Note 2: If you don’t have lemon powder (on Guam, a favorite is Yours Brand lemon powder), you can use unsweetened Kool-Aid lemonade mix.